Social media has always gone hand in hand with tools and apps. From simple alerts to full-blown management systems, there have always been apps to help you get most out of your campaigns. So if you’re looking for the best tools to manage your company’s social media presence, monitor brand mentions or find out if your strategies have any chance of succeeding, you’re in luck. In this post I’m going to show you 7 incredible tools you must try when managing your company’s social media activities. Oh and the best part, they’re all free. Hootsuite is a real Swiss army knife of social media management. The tool is one of the most advanced social media management apps on the market. Even the free version includes almost every feature you’d need to post, schedule and monitor your company’s social media accounts. Sure, it’s limited to 3 social media networks. 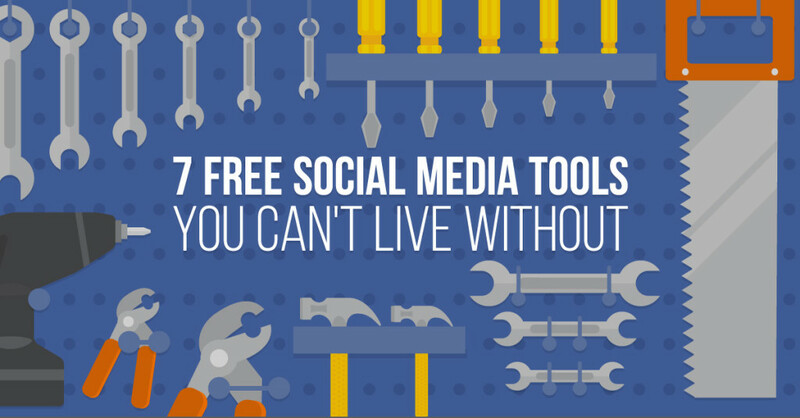 But unless you manage social media for a large company (in which case you wouldn’t be looking at free tools anyway), it should be more than enough. The free plan also includes basic analytics allowing you to view campaign performance over time, 2 RSS feeds and full SSL password security. Team members. It’s only you. Or at least you can use only a single login. Vanity URLs. You can’t shorten URLs into short, brand related links. History and Archiving as well as Enhanced Support. To avail of these options you’d need to subscribe to Hootsuite PRO for $9.99/mo. Type: Social media posting and scheduling. The only way to succeed on social media is by being active – posting and sharing great content. But it’s tough when you have tons of other tasks you need to do each day. Luckily there’s a solution – scheduling posts. Simply schedule any article or other piece of content you think your audience would enjoy in Buffer, pick the time when to post it and what network should it appear on and… the tool will do the rest. Buffer allows you to post scheduled messages to Twitter, Facebook, Facebook Pages, Google+ Pages and Linkedin. You can add comments and modify the message’s content, pick specific networks to publish it to and specify when it should go live. What’s more, Buffer allows you to pick specific date and time or simply preset the most optimal times of the day for messages to go live. Buffer will then publish them one message at a time at those predefined times. For larger companies, Buffer offers a Business account (starting at $50/mo) that increases the number of accounts you could post to 25, allows for 5 members and removes many other restrictions of a free account. You know, your customers talk about you. They share their experiences with your brand, products or services. And quite often, vent their frustrations too. According to AmericanExpress 2012 report for instance, 46% of customers have used social media to voice their frustrations with brands. And we can only assume that the number has grown further since then. But with 85% of customers researching potential companies to buy from online, managing a company’s online reputation has never been more crucial. Luckily there’s a great tool that makes the process super simple – Mention. Mention can monitors the web in real-time for references of your brand, product or any other keywords you specify. It also allows you to respond directly the application. In times where the speed of response is considered one of the key factors of a satisfactory customer service, the ability to react the moment someone voices their concerns is crucial. Mention has a free, basic account. To avail of some of its features though you need to sign up for a paid plan that costs from €29/mo. Facebook is the biggest social network out there. According to identity management platform, Gigya, the social network powered 61% of all social media logins (and is slowly taking over market share from Google). It’s no surprise that more and more brands make a Facebook Page their primary focus of social media marketing. But how can you be 100% sure if your Page performs as good as it could? The answer is simple – by checking it with AgoraPulse’s Barometer. This free tool helps you monitor the performance and benchmark your Page against other, similar ones in your industry. Just connect it to Facebook and it will reveal how your Page stacks up on the market. Online stores get an average 152% ROI from Facebook ads. And a typical AOV is $85. It comes as no surprise then that 2 million companies use the social network to promote their products or services. But unless you’re a seasoned Facebook advertiser, it might be tough to realize if what you’re doing on the network works. Especially if you use them the same way as Adwords (hint: you shouldn’t). Luckily there’s a tool that can audit your campaigns and tell you what’s working and what’s not. How could you get a higher ROI from your ad campaigns. How to figure out your ideal market. How much you’re spending for every demographic segment and much more. The tool’s free and super simple to use – it takes no more than 4 clicks to gain a thorough insight into your app. Data and digital marketing go hand in hand. It doesn’t matter if you work on social media campaigns, content or paid advertising, monitoring and tracking data is the only way to know if you’re making any progress at all. If you’re planning a new social media strategy, then you simply must benchmark against competitors. And that’s what Quintly helps you to do. Even though the free version of the tool is limited to monitoring Facebook only, it still offers an incredible amount of information to use when planning new social media campaigns. Like ‘em or not, hashtags are an integral part of everyday social media experience. You may be using them too to mark messages related to your brands and products. But do you know how your hashtags perform? That’s where Keyhole comes handy. This simple utility tool allows monitoring the performance of a hashtag, brand name or a keyword. Keyhole works with Instagram and Twitter and delivers such insight as impressions, reach, top sites, share of posts, most influential users, demographics, top sources and more. What are your best free social media apps? What do you use to manage your campaigns? Share them with us in the comments.